Place in freezer 30 minutes. Using foil to lift, remove brownies from pan, and peel foil away. Cut into 15 rectangular brownies, 5 rows by 3 rows. Gently insert craft stick into end of each. Place on large cookie sheet; freeze 30 minutes. In small microwavable bowl, microwave chocolate chips and shortening uncovered on High about 1 minute; stir until smooth. If necessary, microwave additional 5 seconds at a time. 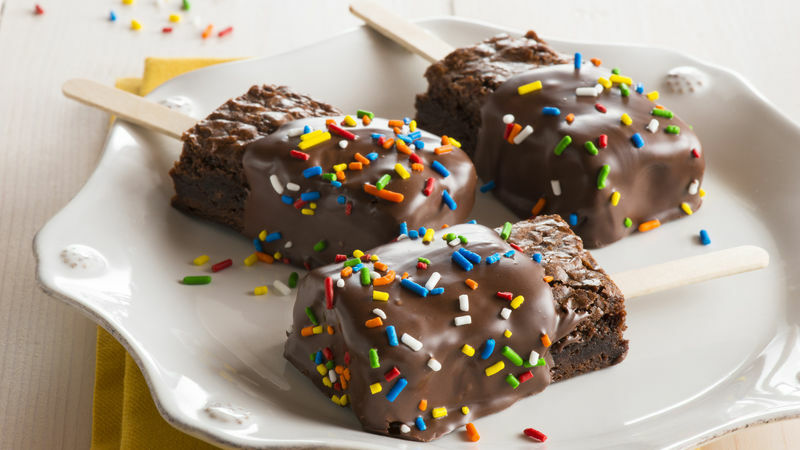 Dip top one-third to half of each brownie into chocolate; sprinkle with candy sprinkles. Lay flat on waxed paper or foil. Let stand about 1 hour or until chocolate is set. Try white vanilla baking chips for the chocolate chips. Visit a cake-decorating supply store or catalog to find an array of candy sprinkles.